It feels like just yesterday; I was in university with friends driving around Mom and Dad’s hand-me-down Grand Cherokees. Although those years are a bit hazy from all the 90s grunge rock, I have one fond memory of a ride home from a very cute blonde who drove a classic, green Jeep Grand Cherokee. 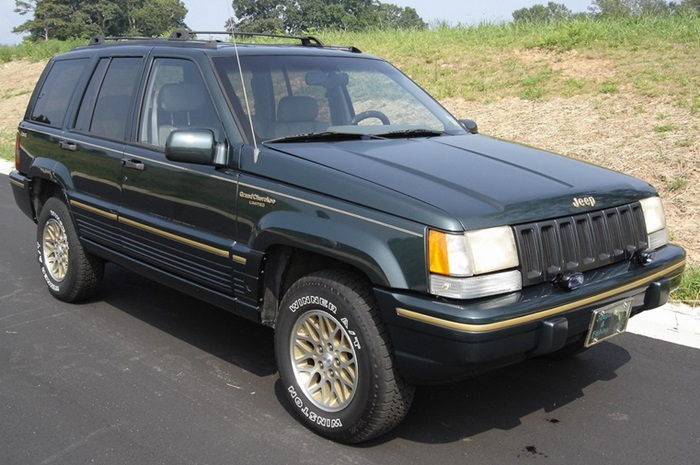 As a young car guy at the time, that combo was equal to a royal flush in poker…..So it comes as no surprise that I have had a soft spot for the Jeep Grand Cherokee. Jeep had incredible success with its 1990 Grand Cherokee models which went on to set the standard for the medium-sized SUV. 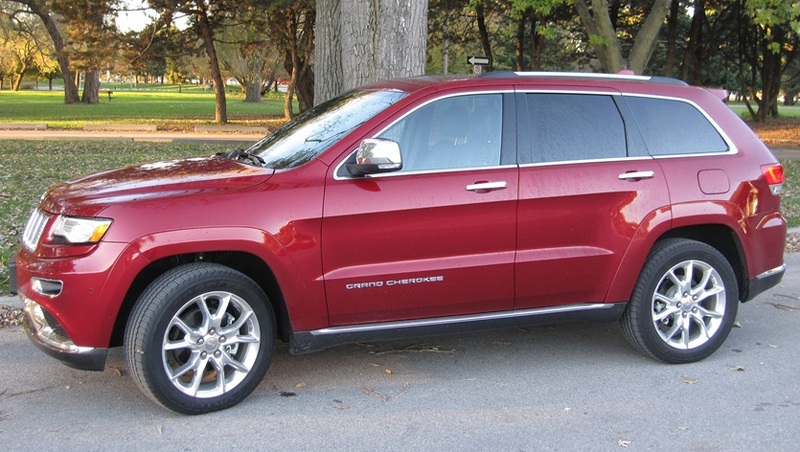 More recently, sales of the Grand Cherokee model have provided significant help to Chrysler’s bottom line through a very critical time in its history. To this day, the Jeep Grand Cherokee continues to build on its success as the benchmark in luxury and performance capabilities within the SUV marketplace. 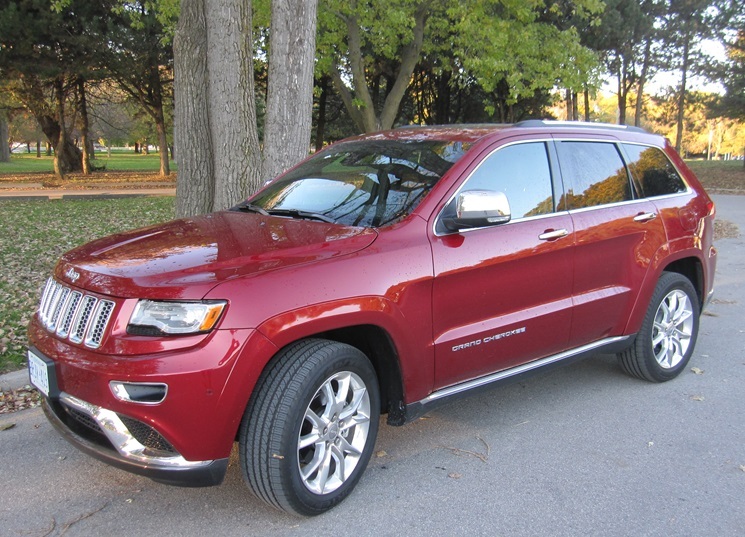 To say the new 2014 Grand Cherokee is not your average soccer Mom’s ride is a complete understatement. This new model is an exceptional piece of craftsmanship and precision built on an outstanding legacy which Chrysler has carefully refined for the past twenty years. Today’s end product is something very special and as a result, we were excited about taking a closer look. The new 2014 model has amazingly clean, sleek lines along with an aggressive 4×4 stance that’s ready to take on any type of road or weather condition. Unfortunately, we never had the opportunity to use the selec-Terrain 4 wheel drive system but we can easily imagine how much fun it is for owners to select and go. Throughout the week, friends, neighbours and car folks we ran into on our travels were all eager to chat about the new ride and many complimented its stellar good looks. 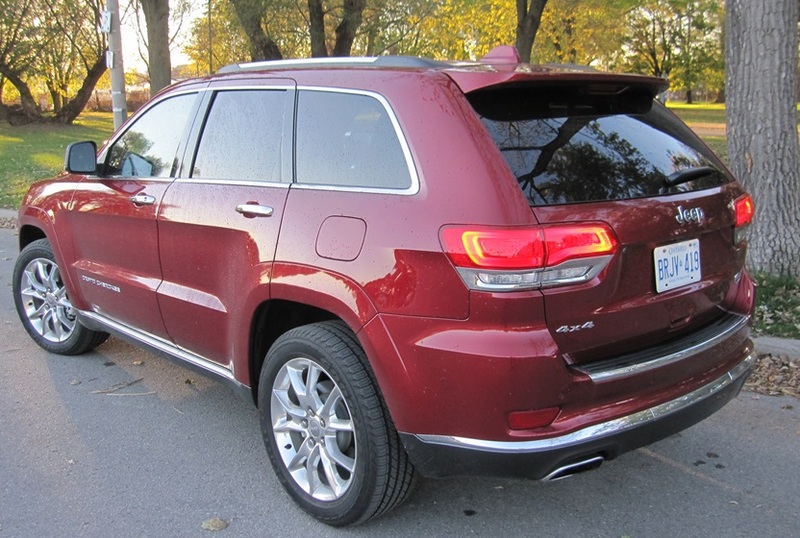 Having driven in both city and highway environments we can say the Grand Cherokee was a real treat to drive in both situations. It has the power and rawness when you need it while also providing the creature comforts of a luxury car with its character and function. Our tester came with the 3.6L V6 which has a posted fuel consumption rating of 12.4L/100 km city and 8.3L/100 km highway. 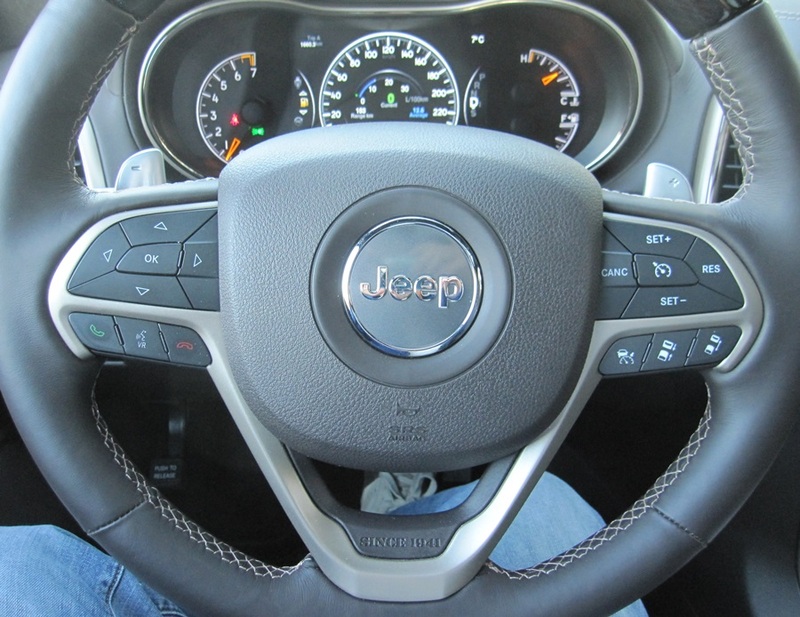 The Grand Cherokee is able to get these stingy fuel numbers as a result of Chrysler’s newly developed eight speed automatic transmission and its Econ fuel saving model. This new improved fuel efficiency does not come at the cost of performance though as the V6 has a 0 to 60 time in the seven second range which is very respectable for a vehicle of approx 4900 pounds. Our test vehicle came in the top of the line Summit trim which includes a range of extras which brought the sticker price to $62,085 CAD. This prices includes some out of this world features not even imagined yet back in the 90s. The interior is beautifully appointed with all seats covered in a high quality leather with the Summit trim branding (pictured above). 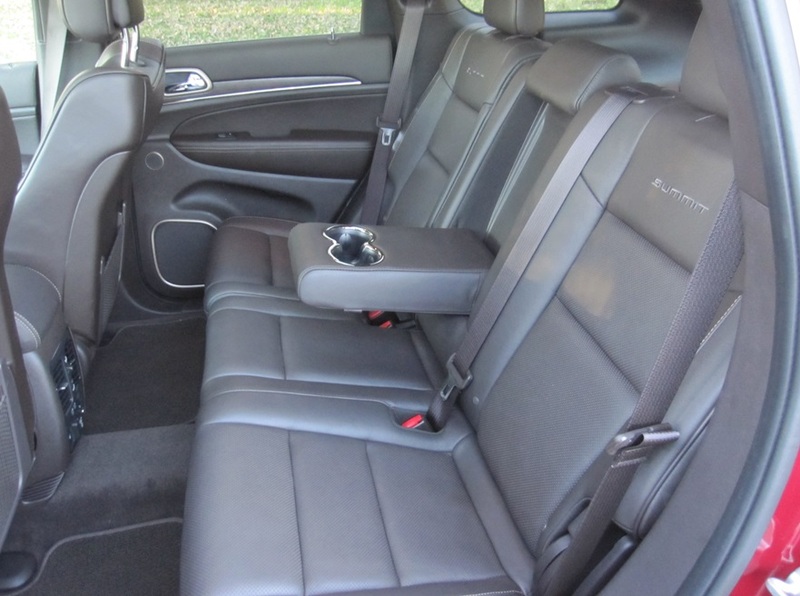 A real attention to detail is noticeable as Chrysler continues to up their game in this area throughout their 2014 line-up. The combination of special interior features such as; heated steering wheel, dual-pane panoramic sunroof and wood trim sets the Summit model apart from its competition. The storage capability is huge as you can see from the (above image) which illustrates how small one standard airline carry-on bag, a computer bag and two pairs of shoes appear in its cavernous rear storage area. 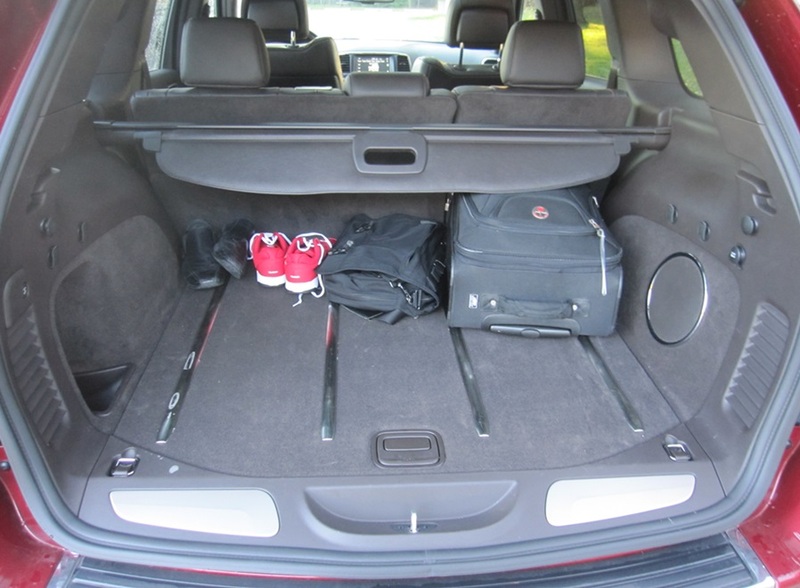 With a very generous 36.3 feet of cargo space behind the rear seats it has space for all your gear and with the rear seats folded down you have access to a monstrous 68.3 feet of cargo room. Honestly, if you need more room than that just buy yourself a min-van. As for its competition, many options are available for North American buyers in this market segment. However, the main competitors include; the Ford Explorer, Ford Edge, Toyota Highlander, Nissan Pathfinder, Lexus RX 350, Acura MDX, Range Rover Sport (significantly more money), and Hyundai Santa Fe XL. However, although some of these competitors can actually seat seven (Grand Cherokee only seats five persons) there is a range of varying levels in exterior and interior refinement, towing capacity and off- road capability of which the Grand Cherokee Summit all brings its “A” game. After spending a week with our Grand Cherokee, I can seriously say if I was in the market for a mid-sized SUV this would be at the top of my list. And most importantly, my wife really liked the look of it since it’s always a good thing when your partner appreciates another vehicle parked in the driveway.